Men’s basketball is now 15 games into the season and expectations could not be anymore unpredictable. The inconsistent play has been a theme throughout the last two months and seems to be here to stay. 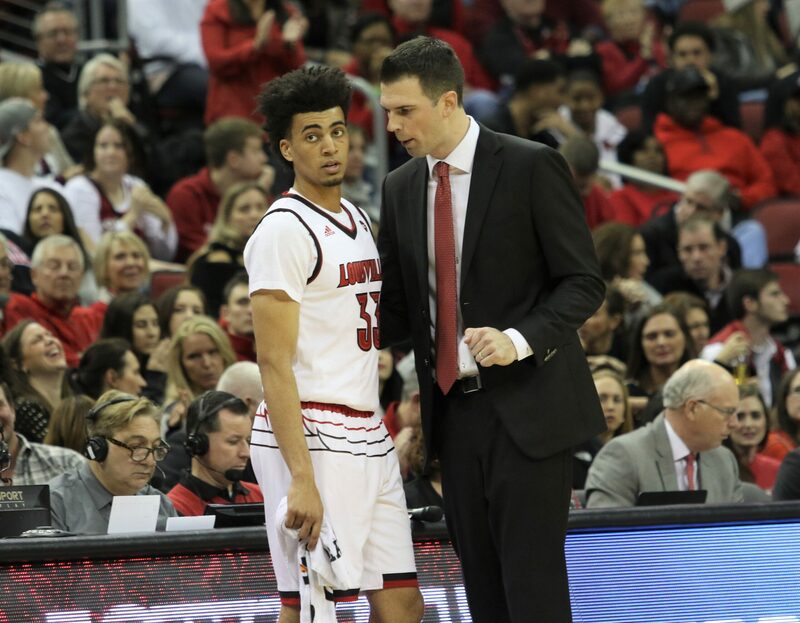 With rotations still being ironed out for the acting head coach David Padgett, it is clear that anyone on Louisville’s roster can play at any moment. This has been especially evident with the sporadic interchanging between the four members of the 2017 recruiting class. Perry emerged early in the season as a crowd favorite. Playing tenacious defense and with pace on the offense end, the 6-foot-2 guard looked like a viable option off the bench. Perry’s minutes and shooting numbers have dipped with Ryan McMahon’s return. The freshman averaged 12 points in the first three games, but has only scored eight points in the last eight games. Although the offense has not been there, the defense has been where Perry has the opportunity to play. “(Perry) hounds the ball. He’s got quickness we haven’t had here in a long time, it’s tough for opposing players to go by him,” Padgett said following the team’s 86-60 victory over Siena on Dec. 6. Much like Perry, Nwora raced off to a hot start for the team, notching 66 points in first eight games. The 6-foot-8 forward has a sweet shooting touch and a high offensive IQ. Unfortunately, offense is just one side of the game. On the defense end, Nwora has looked out of sorts. This could be due to the undiscovered rotations for the club, which result in Nwora playing out of position. Nevertheless, Nwora must find his shooting touch again, only netting 16 points in the Cards last seven bouts. “Jordan Nwora and I were laughing, two years ago he was our top recruit. Well, he got better. He’s really coming. He’s a real offensive threat. He’s like Jared Dudley to me in the NBA,” Siena coach Jimmy Pastos said following their game against Louisville. Williams has been the Cards’ one true big man off the bench this season. Front court depth has been the biggest pitfall for the team. Williams is a finesse big man who plays on the perimeter on the offensive end. With a shooting touch from deep, Williams is 7-of-26 from three. On defense, the 6-foot-11 Fort Wayne native has shown a streak of toughness this team sometimes lacks. Williams must become a better rebounder, as he is seventh on the team with 42 in 149 minutes. “It just goes to show if you practice hard, and you practice well, it usually correlates in the game. Malik is a kid, a really tough kid, plays hard every day in practice,” Padgett said following the team’s 77-51 victory over Pitt on Jan. 2. Thomas hasn’t received the same amount of playing time as his fellow freshmen, only notching 35 minutes this season. The 6-foot-8 forward is still a work in progress, scoring 20 points and grabbing 11 rebounds in his seven appearances. “(Thomas) just continues to work every single day and get better. The improvement he’s made from the first day he got here in the summer to now has been remarkable, so this will be good for his confidence,” Padgett said following the team’s 102-59 victory over Bryant on Dec. 11. You can follow Conner Farrell on Twitter @ConnerFarrell9.